With “mobilegeddon” among us and the world coming to an end if you haven’t got a device/mobile optimised site there seems to be a mad rush to get things in order for us to please Google and its recent update of 21st April. Of course, its not just about pleasing Google is it? Its about making sure that visitors to your site have the best customer experience no matter what device they use. I am in the middle of doing just the same, working on a project to develop a responsive (not adaptive) site within the financial services industry. While undertaking some competitor research and taking in the commerce landscape, I thought I would write a checklist of areas to consider, items to include and their placements on the page. Its all about the customer so make the user experience as quick, easy and painless as you can. HTML5 and the change in sizes of mobile devices over the last few years has left a myriad of design and developing decisions to be made, but using a customer first approach (and the feedback real customers give) allows you to focus on their journey and not what the marketing, the MD or CEO “think” should be on a page or across the journey. Yes, you will have to factor assets into the journey, but try to make it clear and simple. 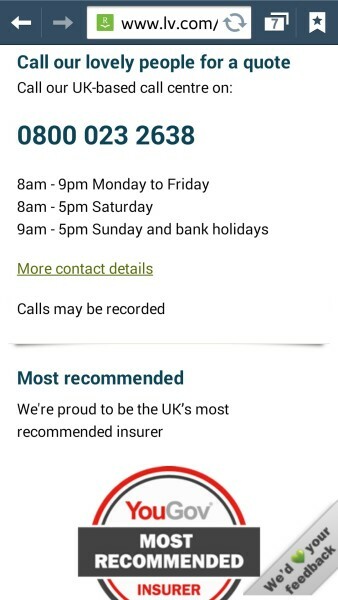 Aviva – insurance and protection provider in the UK, have clear calls to action on both its home page and insurance category level page. 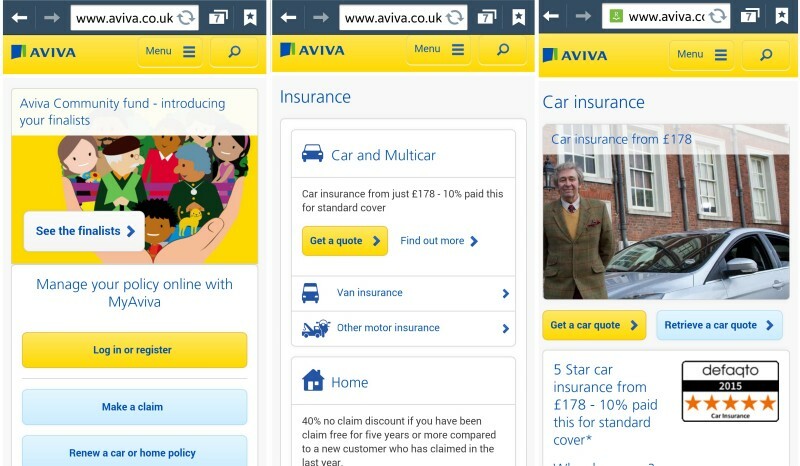 They’ve done a great job in stripping the content out at both desktop view and mobile view, making the decision that car insurance being its primary product and placing that first and this cascades down to mobile view too, if I want a quote I am one button away. What do you want the visitor to do? Think about how or why they are on that page and what you want them to do. I always ask the same question when looking at a new design, scamps or wireframes “what do you want me to click on?” Having clear Call to Actions (CTA), so the visitor can navigate or move along the customer journey easily is top priority. 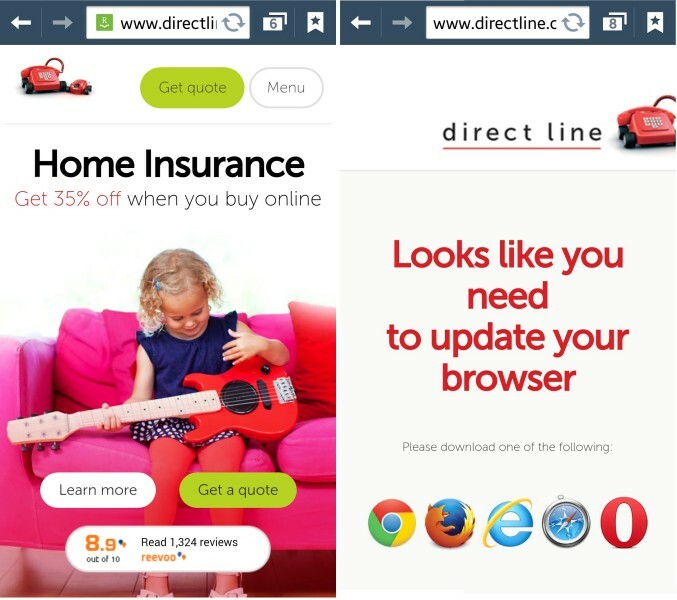 Directline – another UK insurance company have clear CTAs on the page as soon as it loads, from its homepage to each of the product pages. I am quickly directed to Get a Quote or phone their call centre. No clutter, easy to find more information or move onwards. Maybe it’s a glitch, but everytime I went to the homepage via my phone it asked me to update my browser, although it worked fine at category and product page. How much product information to include? As you scale down from a desktop view of a page to mobile, its pretty obvious that you can’t just add all the information into one very long column with a button at the end to navigate forward. Working within the financial services industry you have to comply with Financial Conduct Risk (FCA) regulations and internal compliance teams to make sure that the same amount of information that’s offered via a desktop version of a page, needs to be included within a mobile page. There are always going to be these kind of challenges when prioritising the content that a visitor sees when they land on a site, what do you prioritise first, what needs to take prominence and what can be “one click away” for the visitor to be able to access quickly and easily, so they can make an informed decision if the product is right for them. 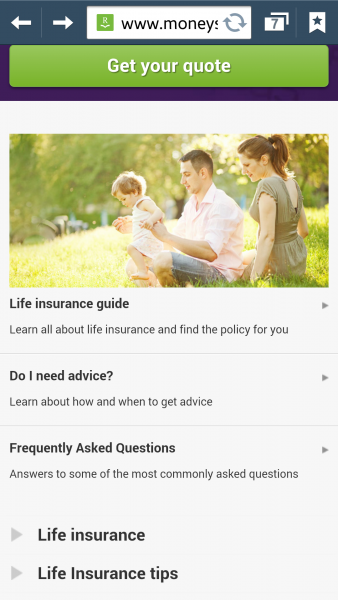 Directline have included a tab system, within the page which seems to work quite well as there is a lot of information around taking out the right life insurance product for you. I think use of expandable areas within the page would also work really well. 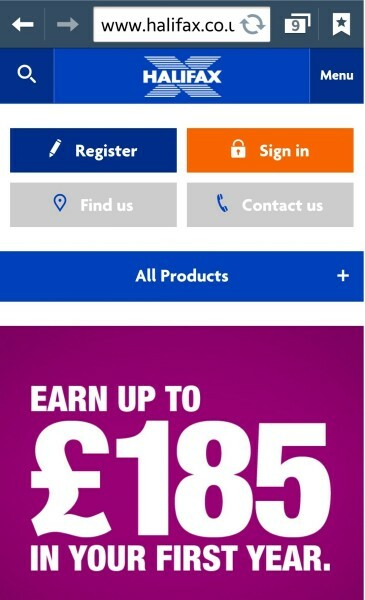 Moneysupermarket links off to other pages for the information and content, which doesn’t feel like the right customer journey for me, so they could improve on it using a tab/expandable nested nav system – nothing wrong with it, just felt clunky over some others. 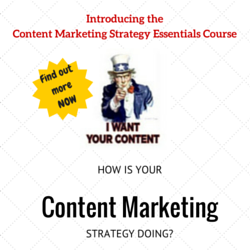 Review the content on the page as a whole, can it be edited down, do you need it all? Similar to the product information, T&Cs are a must across all financial services products, as long as they are labelled, displayed and given the same prominence as the rest of the content on the page then you can easily add them into the page via an expandable nav – so all the information you need is on one page and easily accessible (no matter how long they are, and take it from me… some can be quite wordy). 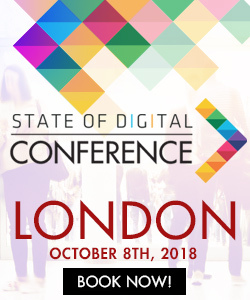 Not all customers who come to your site via a mobile will want to convert via a mobile (yes I can here you now… “..thats not what I read in a report last week/heard at a conference..”), some will need further help in making the right decision. 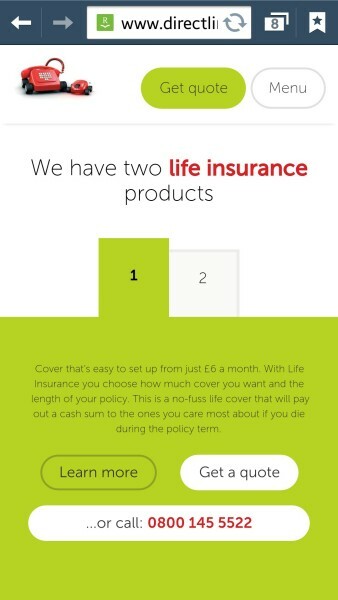 Some customers feel better (and hopefully convert) talking the application through over the phone, especially when it comes to financial products like Life or Home Insurance, so make sure you have contact details clearly displayed as you wouldn’t want to lose them once they are on site. LV have a clutter free and make it easy for customers to phone their call centre – displaying their opening times clearly indicates to a customer of the opening hours, as the last thing you want is a customer to call and find the office is closed (personally, I find those automated messages highly annoying). Visitors to your website want to make sure that are with a brand they can trust, after all they’re taking out products to cover themselves should the worst happen or investment style products where they want to make sure their savings are safe. We all know the benefits of ratings and reviews for brands where they retail clothing, hotel stays, holidays, food and so on but we need to transfer this open and visible way in the financial services industry. Within the industry we need to feel confident that if a customer leaves negative feedback as a review, then its an area that needs to be improved – making sure that other customers don’t have that experience in the future. We see it time and time again across social as a channel for customers to discuss an issue directly with a brand (rather than jump on a call to a call centre to complain). 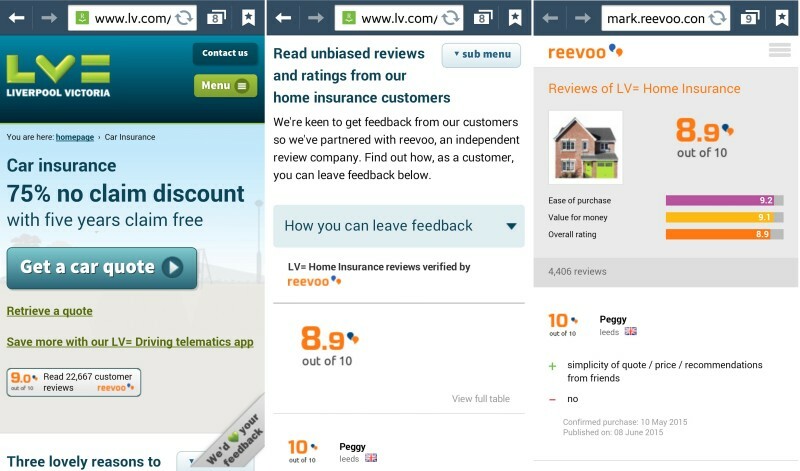 Outside of using reviews, many financial service brands use Defaqto and awards that they have been nominated or won – again adding some authority to being a trusted brand. LV include ratings and reviews of not only the product, but LV as an overall experience and brand too. Personally, I feel it imparts a level of trust and as a potential customer I can quickly read what others have been through. As I am going through this journey now, these are just some of the considerations and challenges that I am working on, the list isn’t exhaustive, but I feel the elements highlighted should form a part of each area of the site you start to develop and how to overcome some of the challenges around content placements and stack some of the very long and copy heavy pages. If you feel I have missed out on some areas, please leave a comment below – and good luck! In the end just try to keep it simple, clutter free and give your visitors the right signals to get to where they want easily and as pain free as possible.